The information conveyed by any color depends on how that color is produced. The bill’s pink color is probably carotenoid-based: that is, molecules called carotenoids give it its pinkness. Most reds, oranges, and yellows in animals are carotenoid-based. 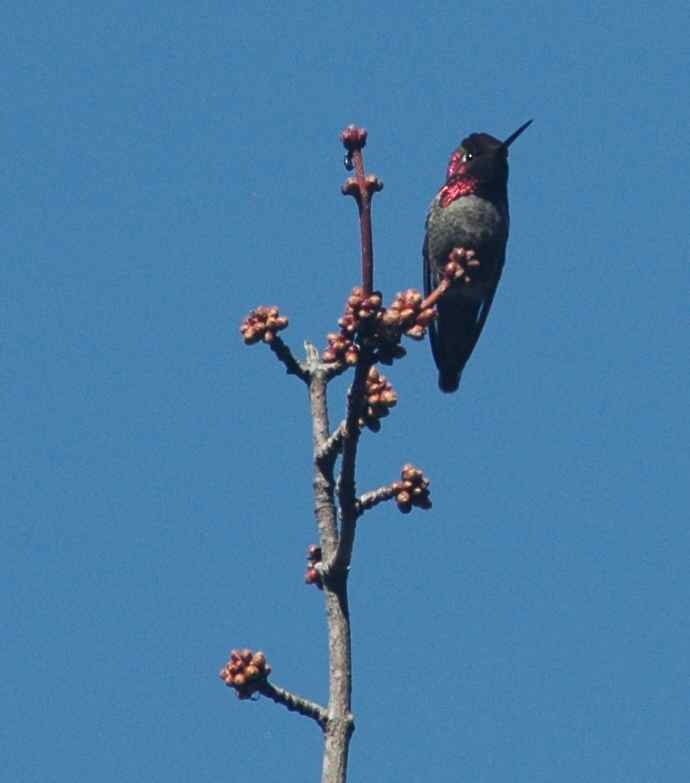 Carotenoids can’t be made by a bird’s body, so in order to acquire those sorts of colors, birds must find and eat things containing carotenoids. Because carotenoids are used in vital physiological functions (e.g. 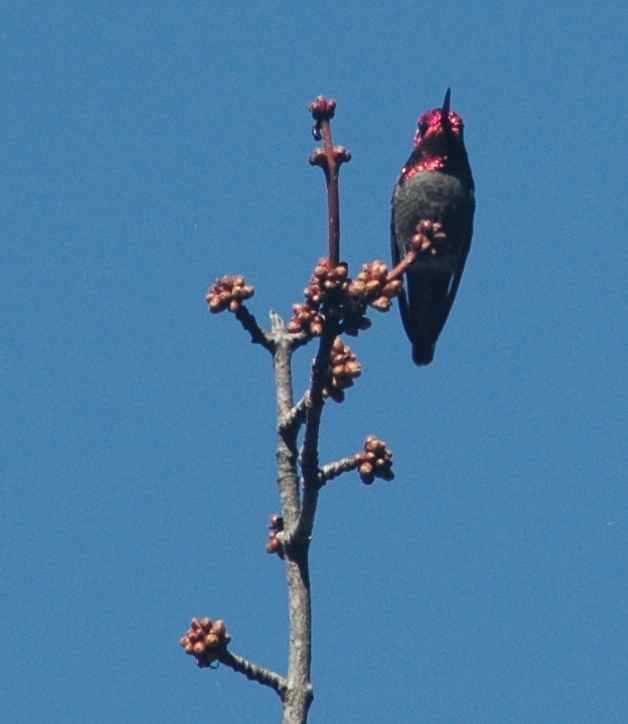 as antioxidants), and carotenoids used in those functions are used up and can’t be then used to make a bird brighter, birds face a trade-off between health and color. Only the “best” birds – the healthiest, the best at foraging – can afford to allocate enough to carotenoids to cosmetic purposes to make themselves bright. 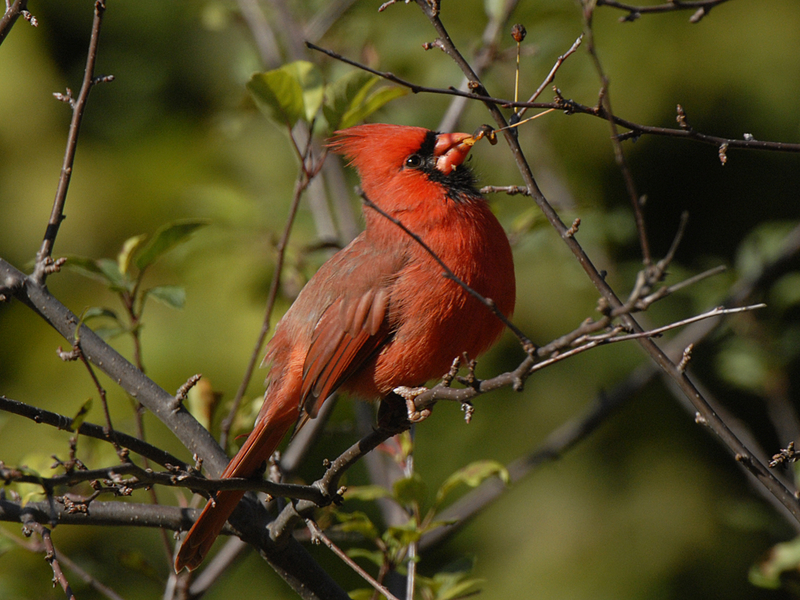 This male Northern Cardinal’s bright red advertises his foraging prowess. 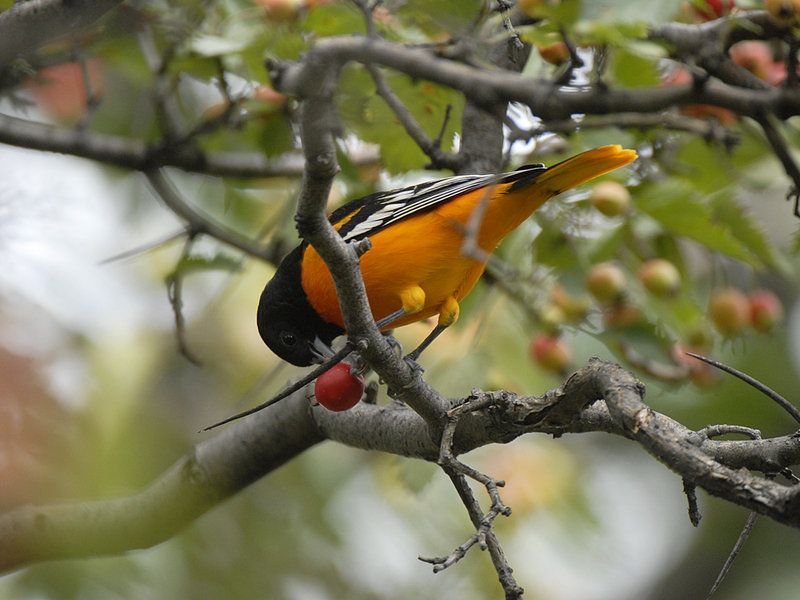 That berry may contain carotenoids to help this male Baltimore Oriole stay orange. Purples, blues, and iridescent colors are structural colors. They derive their color not from pigments alone but also from the structure of the feathers. Light that hits the feathers is reflected by a series of layers in such a way that certain wavelengths are preferentially emitted. This is why iridescent feathers look different depending on what angle you view them from: some structural reflection only works from certain angles. …to the perfect angle for his iridescent colors to be reflected to us. Work on Brown-headed Cowbirds (McGraw et al. 2002) suggests that structural colors, like carotenoid-based colors, depend on the nutritional state of the bird. Structural colors don’t use up an essential nutrient the way carotenoid-based colors do, but they do depend on fine-scale control over the microstructure of the feathers, which perhaps is costly to a stressed bird. So, back to our three imaginary Superb Juncos. Bird A has the bright pink and purple of a well-nutritioned bird, but his pale head suggests that he is fairly non-dominant. He is likely to have a poor territory or no territory at all. Bird B is dominant, but with his pale bill and dull body he seems nutritionally stressed. Bird C is both dominant and well-fed. If you were a male Superb Junco, you would be more willing to challenge Bird A to a fight than Birds B or C, since Bird A’s pale head suggests he isn’t very dominant. If you were a female Superb Junco, you would probably choose Bird C as a mate, but you might also choose Bird A: females tend to pay attention to carotenoid-based and structural colors but not melanin. Females need healthy mates who will survive the breeding season and be able to provision their chicks well, so it’s the nutrition-related signals that matter to them. Females also pay attention to territory quality, however, so if Bird A has a poor territory then he would not be a first-choice mate. Birds can undoubtedly tell more from each other’s color signals than we currently can. Hopefully future research will let us understand things like why the male Great Frigatebird shows off with both a bright carotenoid-red throat patch and shiny structural iridescence on his body, which seems redundant since both are related to nutrition. Is it harder to fake both, giving the combination greater honesty? Do they indicate slightly different aspects of the bird’s nutritional state? 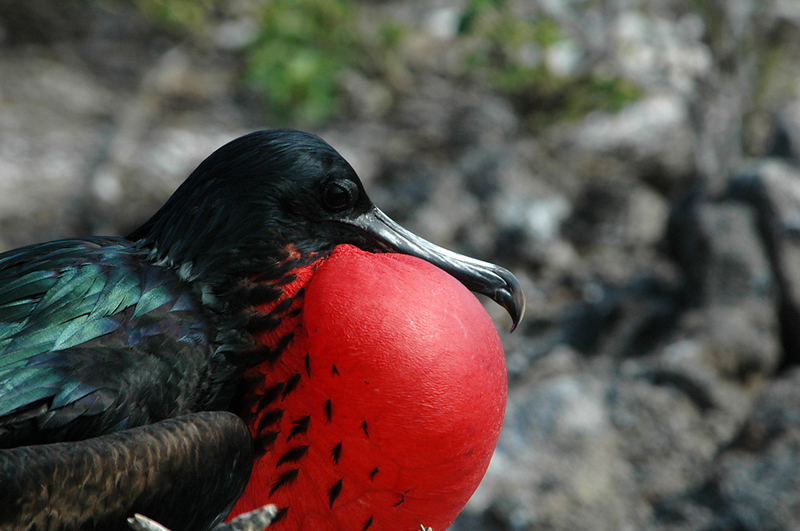 Male Great Frigatebird with his throat sac inflated for display. Even if our translations are crude now, it’s exciting to be able to decode birds’ color signals. McGraw KJ, et al. 2002. 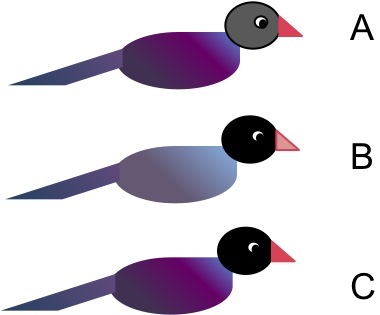 Different colors reveal different information: how nutritional stress affects the expression of melanin- and structurally based ornamental plumage. Journal of Experimental Biology 205:3747-3755. Saks L, et al. 2003. How feather colour reflects its carotenoid content. Functional Ecology 17:555-561. This entry was posted in general science-y stuff, other people's research and tagged biology, birds, color, communication, feathers, science by toughlittlebirds. Bookmark the permalink. Can you also learn about the history/trends of bird health, then, from colors of birds collected and saved in museum collections? 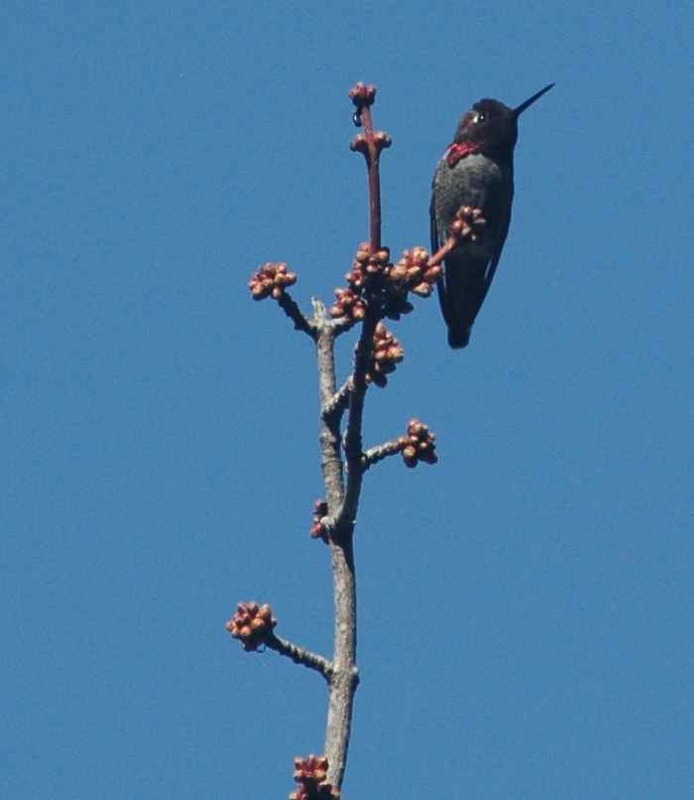 Do these studies address the colors birds can see but we can’t? There has been work on UV (which they can see but we can’t) – I believe it counts as a blue/purple, and therefore is structural, but don’t quote me on that until I look it up. Brighter UV seems to indicate health in the cases where it’s been studied. It has been studied less, though, since it requires more specialized equipment to detect UV. Just yesterday I was wondering about what was going on with a male Western Tanager who had hardly any red on his head, and now I know! Great post.